Sometimes, the urge to garden might be stomped out by other circumstances, such as living arrangements or space constrictions. If you live in an apartment, you can't really operate a full garden, just because you don't really have a yard! I think that one of the best solutions for this problem is to grow plants in containers. You can hang these, or just arrange them on your patio, window sill or balcony. Just a few baskets or pots, and your whole living area will look much classier and nicer. Container gardens can create a natural sanctuary in a busy city street, along rooftops or on balconies. You can easily accentuate the welcoming look of a deck or patio with colourful pots of annuals, or fill your window boxes with beautiful shrub roses or any number of small perennials. Whether you arrange your pots in a group for a massed effect or highlight a smaller space with a single specimen, you'll be delighted with this simple way to create a garden. Experiment with creative containers. You might have an old porcelain bowl or copper urn you can use, or perhaps you'd rather make something really modern with timber or tiles. If you decide to buy your containers ready-made, terracotta pots look wonderful, but tend to absorb water. You don't want your plants to dry out, so paint the interior of these pots with a special sealer available from hardware stores. Cheaper plastic pots can also be painted on the outside with water-based paints for good effect. When purchasing pots, don't forget to buy matching saucers to catch the drips. This will save cement floors getting stained, or timber floors rotting. If you have steps leading up to your front door, an attractive pot plant on each one will delight your visitors. Indoors, pots of plants or flowers help to create a cosy and welcoming atmosphere. Decide ahead of time where you want your pots to be positioned, then buy plants that suit the situation. There is no point buying sun lovers for a shady position, for they will not do well. Some plants also have really large roots, so they are best kept for the open garden. A benefit of growing in small containers is the fact that you can move them around to suit your needs. If you rearrange your furniture and you think that it would look nicer if it was in the other area, it's no trouble at all to scoot it over. As long as the lighting is about the same, your plant shouldn't mind the transition at all. Another benefit of the containers' versatility is the fact that you can adapt it to simulate any environment depending on the type of soil you fill it with and where you place it. If you are trying to make an aesthetically pleasing arrangement of containers and plants, you can adjust the containers to be at different heights by hanging them from the ceiling or placing them on supports. Hanging them will allow you to make the most of the space you have. This is called “vertical gardening”. If you pull it off right, you can make a very pleasing arrangement of plants while conserving your valuable space. If you live in an apartment, you know how important it is to conserve space! One method of vertical gardening is the use of a wooden step ladder. If painted correctly, you can arrange all the plants on it in a beautiful, stylish cascade of color. The maintenance of container plants takes slightly more time, since you have to water more often and go around to each individual container. However, the square footage for container plants is much less than that of an actual garden, so the time spent on maintenance and watering is more balanced. It is important that you don't over-water your container plants, as this can be just as fatal to their health as under-watering. When choosing containers for your plants, you'll want to buy them all at once along with some extras in case they break or you add more plants later. You don't want them to be all the same shape and size, but definitely the same style so that the compliment each other. Plastic containers are the best and require the least amount of watering, but if you want to stick with clay or earthen pots then you should line the inside with plastic. This helps it retain water more, as the clay will soak up water. Another thing to remember when buying pots is the fact that the size of the pot will ultimately constrict the size of the plant. Make a careful choice of pots according to what you wish to grow in each one. If you search for the plant you chose on the internet, you should be able to find specifications as to how much root space it should be given. This can even be an advantage for you if you choose a plant that can grow very large. If you only have a limited amount of space for it, you can constrict it by choosing a pot that isn't large enough to support huge amounts of growth. If the benefits of container gardening sound appealing to you, then you should start planning out your container garden today. If you write a list of all the plants you desire to have, you can do the necessary research to find out what size and shape of pots you should get. After that, it's just a matter of arranging them in a way that makes your home look the nicest. 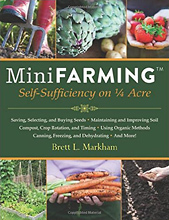 Mini Farming: Self-Sufficiency on 1/4 Acre, by Brett L. Markham. Start a mini farm on a quarter acre or less, provide 85 percent of the food for a family of four and earn an income. 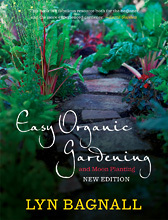 Easy Organic Gardening and Moon Planting, Lyn Bagnall. I just love this book. It's not laid out like a glossy magazine-page-style gardening book, just a plain old fashioned book with plain text. 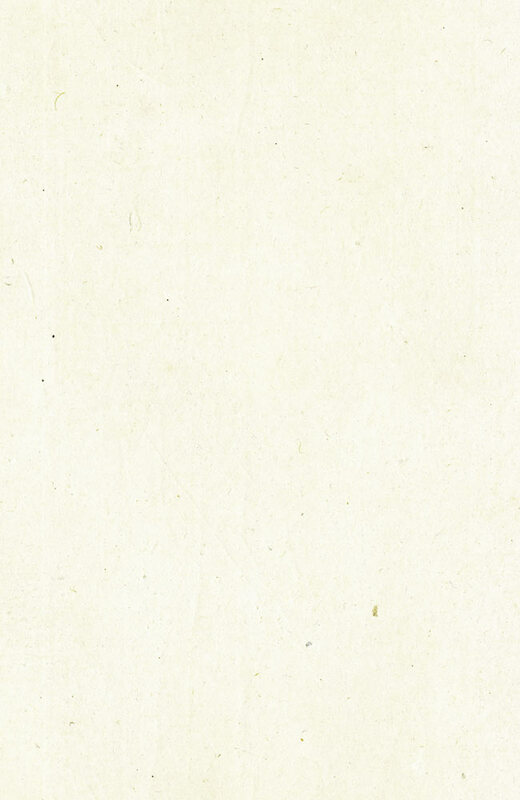 There are no pictures and the paper is nice and thick novel-style book paper, which is not glossy and does not smell of toxic chemicals in the way that colour books do. I find this book really easy to read, I love to pick it up and read bits from it and I have been learning heaps from it since I bought it. It's not the most basic book so I would not recommend it as your first and only vegie gardening book, but if you have either another basic book (with pictures) or a bit of experience, I would absolutely recommend it. It have added it to this page because it includes a good section on container gardening, going into a lot of depth.